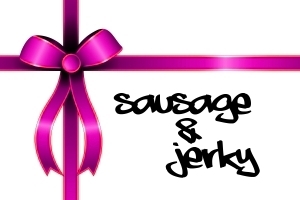 *Please use the comment box to request your choice of sausage and jerky. If you do not indicate a preference we will create a "Butcher's Choice" selection for you. There are no returns accepted for "Butcher's Choice" orders. Please use the following to request your preference. You may mix types and flavors of sausage but please do so in 1 pound selections. Please indicate your choice of sausage & jerky.